WHAT HAPPENED TO OUR FAMILY FROM 1851? This James was baptised in Ballyduff on 22 December 1836. There is another James (bapt.1832) in our extended family. He was the son of Bartholomew Donoghue (b.c.1800) and Bridget Ferris. There is also a later James (bapt.1843) to John Donoghue (b.c.1810) and Joanna Boyle. It is a common first name, in Irish Séamus. This adds confusion to any search for one specific person of this name. Our James does not appear with the family in London. When they left in 1850/1 he would have been about 15. His elder sister, Julia, left with her parents as did his younger one, Catherine. When the famine struck in 1845 he was 9, perhaps he didn’t survive? Did he marry locally? An individual was regarded as having reached marriageable age at 14 years, if a male, and 12 years, if a female. Parental permission was required up to 21. There are some potential couples which might be our James, but none convince me. I have looked for him in the UK and the USA. It is my belief the rest of the family came to England via Liverpool and there is a James Donohoe age 30 (so not born in 1836; but people lied about their age) with his wife Julia living in Liverpool with Conors and Boyles in 1861 – two children: Mary Ann (our James’s parents’ last child also was given this name) and Catherine (his younger sister’s name). But they are not there in 1871. One possibility is that he joined the British Army. While there must have been some age limitations I doubt it was much of a bar to enlistment. In 1871 a James Donohue (b.1837) was a soldier in the 95th (Derbyshire) Regiment of Foot stationed at the New Military Barracks, Alverstoke, Hants. As far as the USA is concerned James Donahue, a shoemaker, arrived in 25/10/1854 aged 18 on the ship New World from Liverpool. Also on the vessel were an Ellen, 20, John, 21, Catherine Donoghue, 19, and Patrick, 32, & Mary Boyle, 30, plus Connors. I have searched the 1860 and 1870 USA censuses but there are not enough clues to pinpoint anyone precisely enough. Many folk from North Kerry went to Hampden County, Massachusetts. In the 1855 Massachusetts State Census in Holyoke, Hampden County there is a James Donahue b1836 with a Catherine. There are lots of other Donoghues and Connors, Sullivans, Harringtons and Fitzgeralds, all good North Kerry names. But no Boyles. I know an O’Connor with Donoghue in his heritage whose ancestor came from Drommartin just down the road from Ballyduff and settled in Holyoke. We think our two families must have a connection at some point too early to verify. So the reality is that I have, as yet, no firm evidence of what happened to James…to be continued. Catherine was baptised in Ballyduff on 21 June 1839. She would have been known in Irish as Caiterína or Caitrióna. There was one other of the same name in the extended family baptised in 1844. She presumably left Ireland in 1850/1 with her parents and siblings as they journeyed to London, but she does not appear in the records until 1867 when she was godmother to her niece Catherine, who we know as Aunt Kate; the latter lived on the top floor of 60 Cotton Street for many years. In 1871, Catherine, her mother and brother, John, are living with her older sister, Julia Carrington, at 3A Market Street, Poplar. She consistently understates her age: 26 in 1871 when she was in fact 32. She is described as a servant which may explain why I have been unable to find her in earlier records as she may have been living in her employer’s house (but should still have been covered in the census) or perhaps came to England later. She was unable to write her name in English. 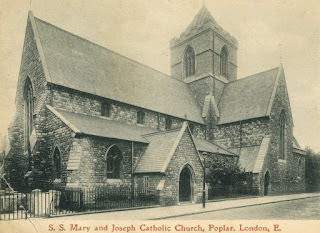 The marriage took place in the family’s local Catholic church, St Mary & St Joseph’s, Canton Street. There is a splendid modern church on the site now but in 1872 it looked like this and had been built in 1856. A Catholic journal, ‘The Lamp’, in 1894 described it as one of the most beautiful in England. Back in the 90s I got to know a lovely lady at the Presbytery who supplied all sorts of useful information. I still have all her letters on file. James Madden gave his age as 25 and was a labourer. Perhaps Catherine felt that she had to be one year younger? He was living at 21 Charles Street, just along from Thomas Donoghue, Catherine’s brother and my great grandfather at No.2. This must have a temporary address just for the wedding because he was not there in 1871. His father was named Michael and is described as a farmer, but then everyone was a farmer of some sort in Ireland. Interestingly both witnesses are from Catherine’s family, her brother Thomas and his wife Mary. This suggests that James did not have family in London or that he was distanced from them. When our family first came to London they were living in Sophia Street. By 1881 the rest of the family had moved north of the East India Dock Road and were living in what Booth described as ‘Mixed. Some comfortable others poor’. Rook Street was classified as ‘Lowest class. Vicious, semi-criminal’. So life for Catherine, a charwoman, and James, a labourer, must have been very difficult. James and Catherine had four children: Michael (b.1873), Richard (b.1875), Catherine (b.1876) and Mary Ann (b.1879). Michael was baptised at St Mary & St Joseph’s, his godparents were my great grandparents, Thomas and Mary. Mary Ann’s godmother was Christina Carrington, the daughter of Julia and John Carrington who I wrote about in the last blog. My Uncle Len told me that the family used to talk about the Carringtons and the Maddens a lot. So it appears that the families remained very close. There is, however, no record of the Maddens in the 1891 census or later ones. They seem to have left Poplar, and I would go as far as to say that they had left the country. I have found no evidence after 1881 of James and Catherine’s deaths or of their children’s marriages in this country. Catherine’s younger brother, John, also does not appear in the 1891 census and I was told that he had emigrated to the USA. I have checked censuses for America, Canada and Australia, and even the Irish one for 1901, with no success.